You turn on your tap and orange colored rusty crud comes out. It smells bad and tastes worse. You’ve been told not to drink it, not to bathe in it, not to wash dishes in it, yet there are few alternatives. Worse, you now understand that it is laced with lead, leached from pipes due to a change of the city water supply imposed for austerity reasons by Governor Snyder’s appointed emergency manager. Lead kills and is especially toxic to children. Any child in the city who has been drinking the water will forever be affected. Welcome to Flint, Michigan. 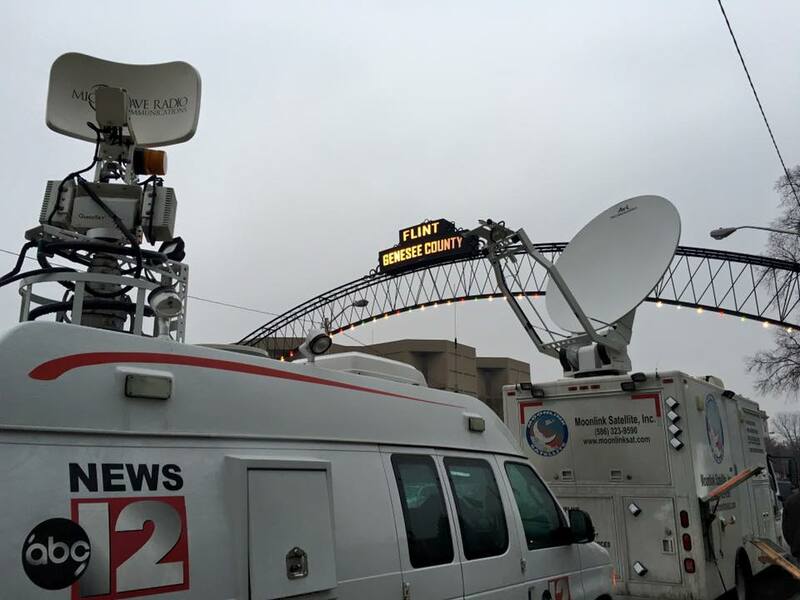 Entry Into Flint. Photo by Rich Samartino. On Friday morning, the Detroit Light Brigade packed their newly acquired bus (the “Social Bustice”) with light panels and supplies and hit the highway for their “Arrest Snyder Road Trip.” In spite of the cold rain coming down hard, over 300 people showed up for a rally at City Hall. A huge puppet head of Snyder was there, dressed in prison stripes – appropriate since City Hall stands right across from the jail. 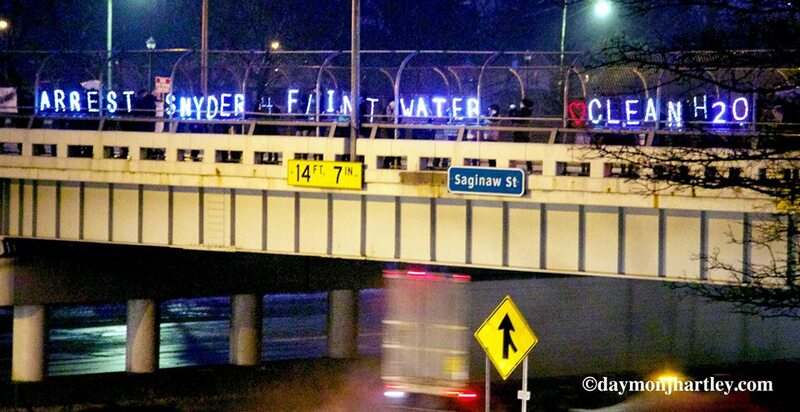 Later that evening, the DLB held a long message over the highway: “ARREST SNYDER 4 FLINT WATER.” After all, it is considered an act of terrorism to poison a municipal water supply. All blame lands on his desk, since he forced an emergency manager onto the people of Flint, thereby becoming solely responsible for ensuing outcomes. 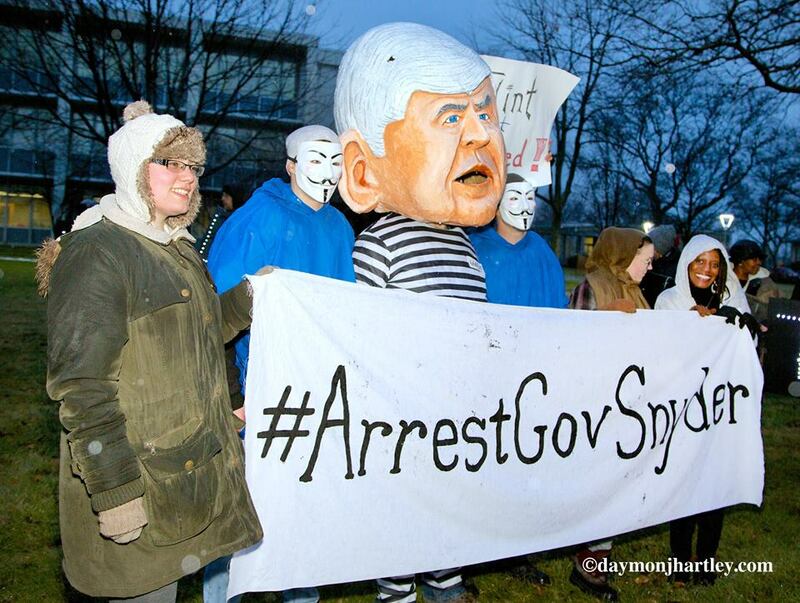 Arrest Governor Snyder. Photo by Daymon J Hartley. Unloading Water. Photo by Daymon J Hartley. Bridge Action. Photo by Daymon J Hartley. I watch a video posted on Facebook. 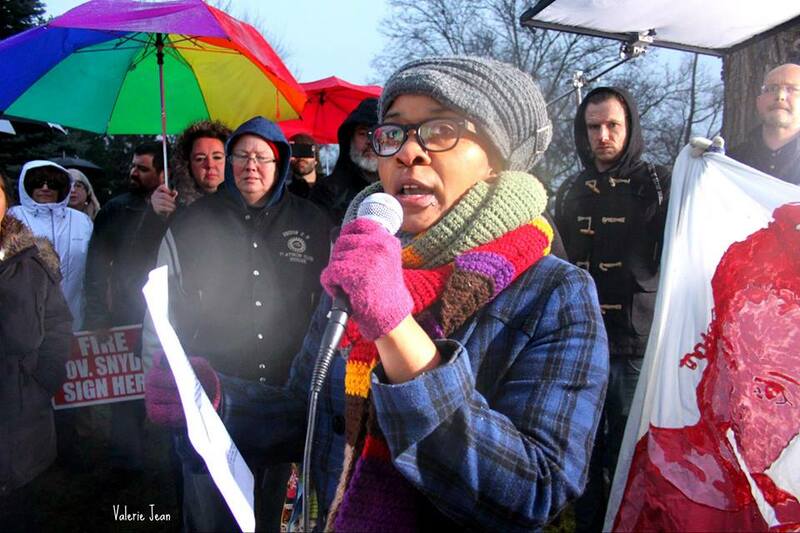 A young African American woman addresses the crowd. Her voice, amplified through a bullhorn, crackles into the night full of people. “Governor Snyder, you can take your apology and flush it down the toilet!” she exclaims to raucous cheers. Snyder, dressed in his black and white prison stripes faces the bullhorn, his huge puppet head weaving a bit under a black umbrella, his mouth open to the rain. Rain splatters down in streams, rivulets caught in the glaring light of the media’s temporary interest. I think of Valerie Jean’s comment on the phone, “Here we are, a Great Lakes state sitting next to one fifth of the world’s fresh water supply, and we are dying for water.” I wonder: What happens next? Flush Snyder! Photo by Valerie Jean. Are we really so broken that we are willing to accept that a governor and his specifically appointed proxies, through ignorance and negligence, poison an entire city? Why are they not declaring emergency? 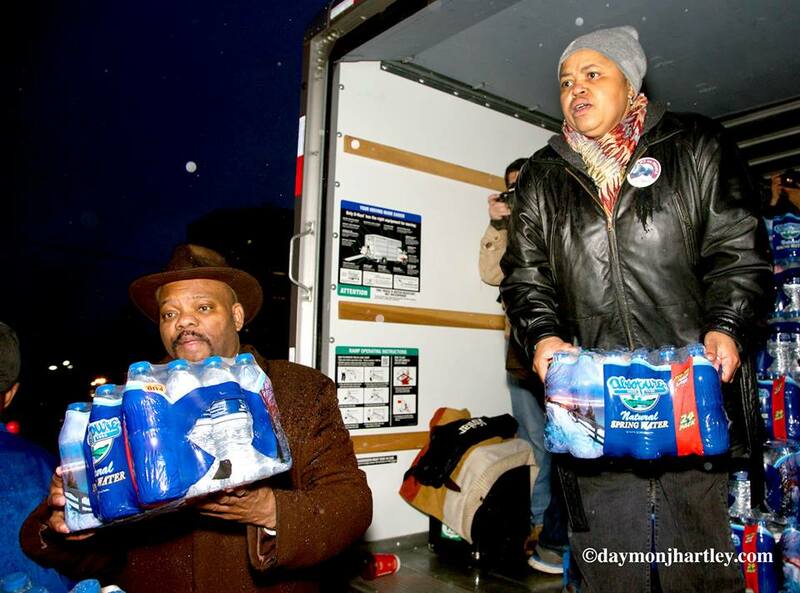 Why are they not amassing emergency response teams that distribute water to any citizen who draws from toxic piping? Why are they not putting in immediate plans to rebuild the water infrastructure, in order to create a healthful environment for all citizens – their citizens, citizens of the State? 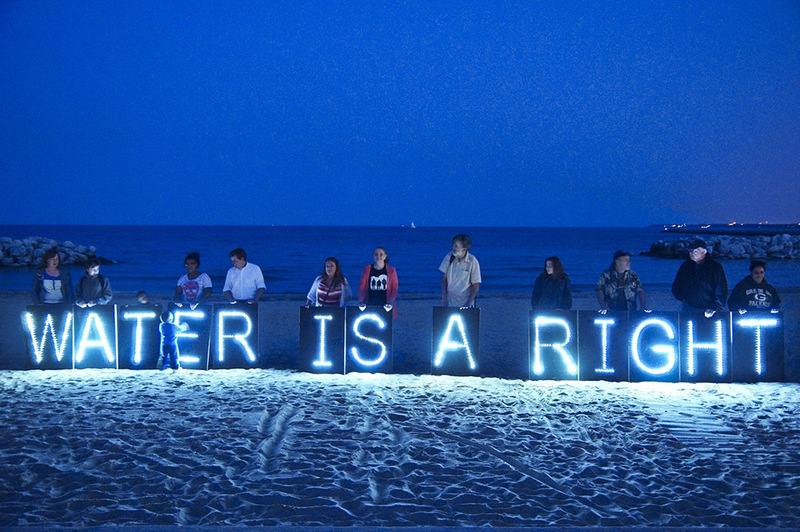 After all, water is a basic human right. What part of that United Nations declaration do they not understand!